Spring Home Tour 2017: Welcome Friends! If you read my blog regularly, you know that I decided to turn my dining room into a sitting room. It’s the smallest room in my house and just wasn’t working to host everyone for holiday meals. So the dining room became my sitting room and the living room will become the dining room. A new tufted ottoman from HomeGoods and my script chairs provide comfy seating. A new cabinet and pendant light round out this side of the room. The gray-washed cabinet is also from HomeGoods. It’s the perfect size for this wall and gives me additional storage. 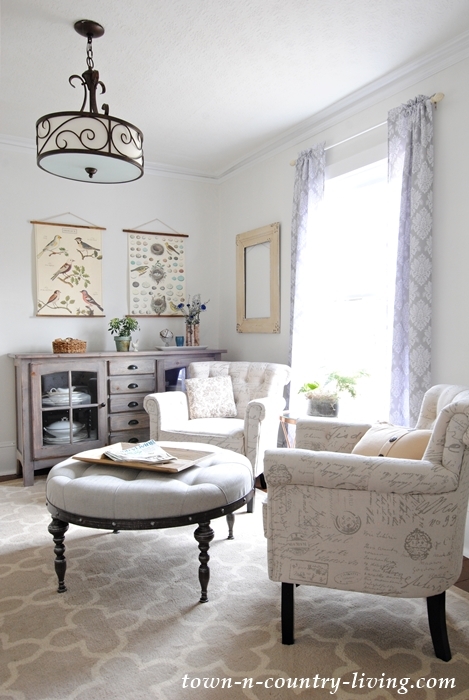 I originally chose a different pendant light for this room, but I ended up hanging it in the family room. Decorating Tip #1: Wall art doesn’t have to be expensive. 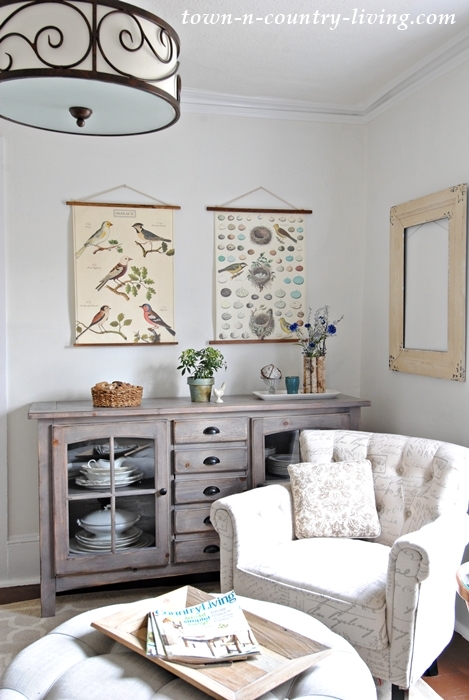 A pair of bird charts adds spring freshness to the space. The posters are less than $5 each and I added wood strips and rope to hang them. See my hanging poster tutorial on how to make your own. On the cabinet, a birch bark vase holds silk spring flowers. 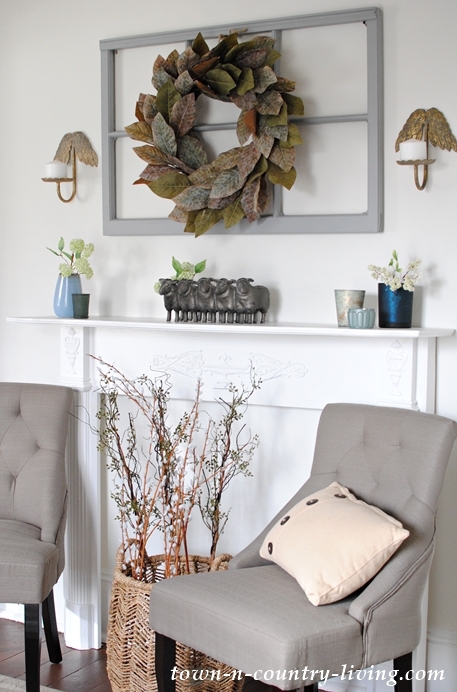 Decorating Tip #2: On the other side of the sitting room is the mantel with a fresh coat of white paint. When you want to transform a piece of furniture, give it a new color with paint. It’s an economical way to make a big impact in a room. A magnolia leaf wreath hangs on my empty window frame from the flea market. I gave the frame a fresh coat of gray paint. Angel wing sconces flank the window frame. 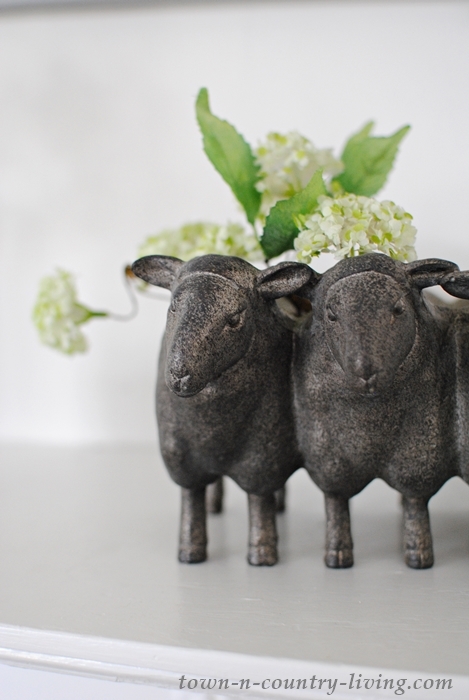 And that sheep planter? I’m obsessed with it! I tucked a few sprigs of white silk flowers inside. 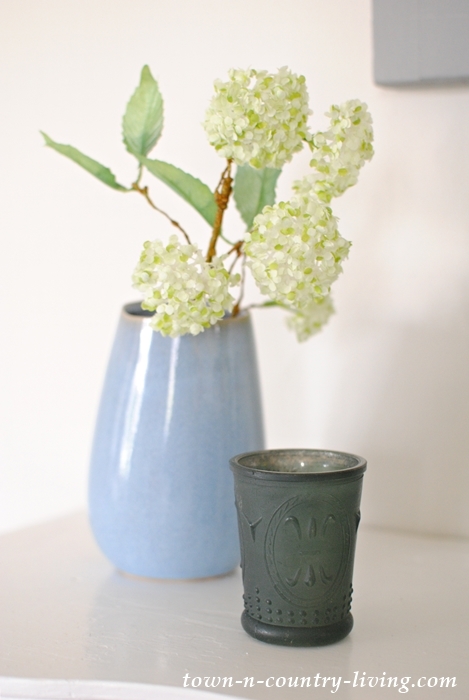 As luck would have it, I found this leaning blue vase for just under $8. 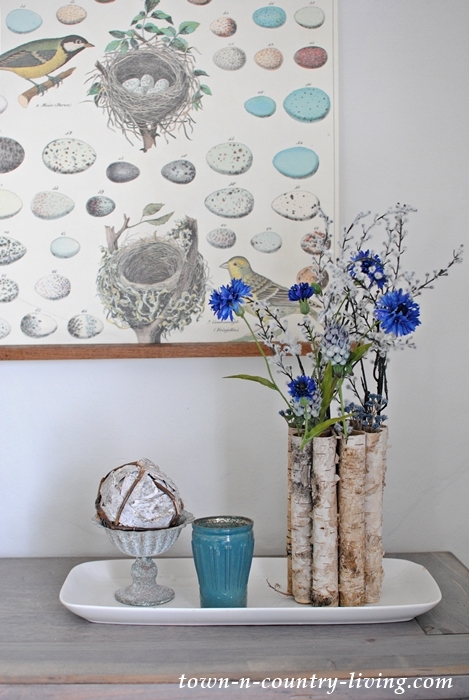 I featured the blue votive on my winter mantel (which looks more like a spring mantel). Onto my kitchen. After months of gray winter days, I like to add sunny cheer in this space. 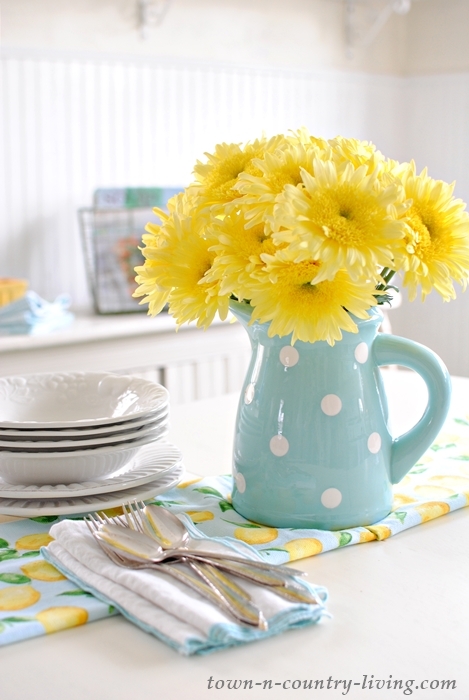 Decorating Tip #3: Use grocery store flowers in your decor. You can often find big bunches of blooms for $10 to $15. To keep them fresher longer, cut the bottom of the stems every few days. 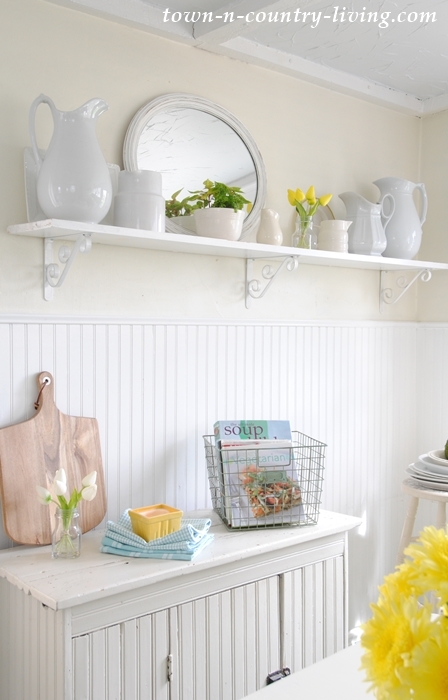 Spring is the perfect time for de-cluttering your home. I’m trying to rid myself of stuff I don’t need, editing flat surfaces like shelves and tables. Morning sun pours in the windows above the kitchen sink, keeping the space light and airy in a natural way. 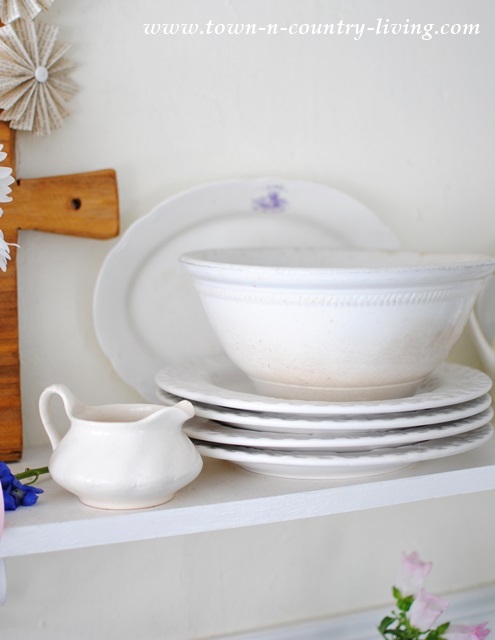 I love the simplicity of white ironstone on my open shelves in the kitchen. 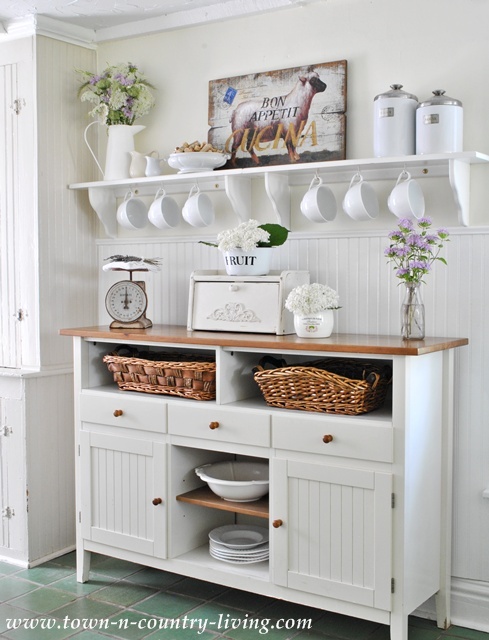 I feel it adds a classic touch to my farmhouse kitchen. The Bon Appetit sheep sign replaces the Dairy cow sign that was here previously. 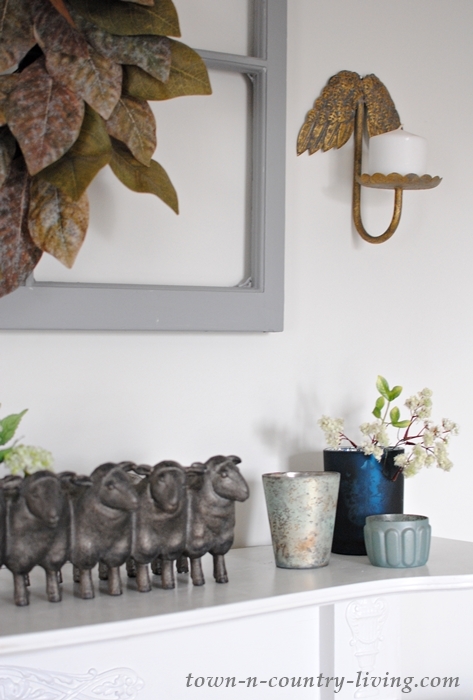 I’ve got sheep in the sitting room so I added one in the kitchen, too. 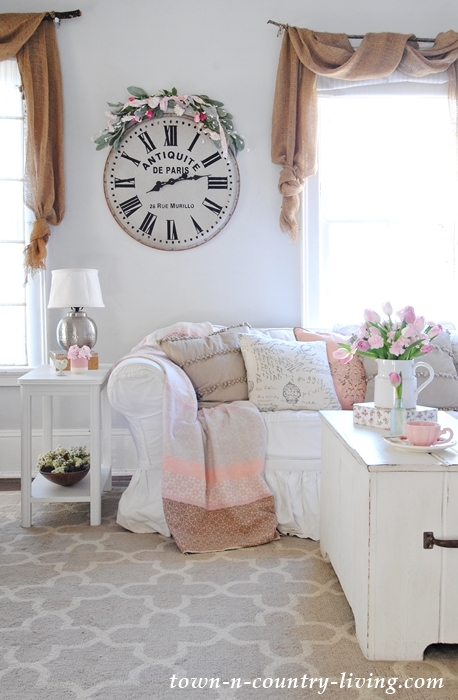 I used pink in my family room at Christmas, and I’m using it again for my spring home tour. I didn’t hang my new pendant light in the family room before I took the photos, so it’ll have to wait for a future post. 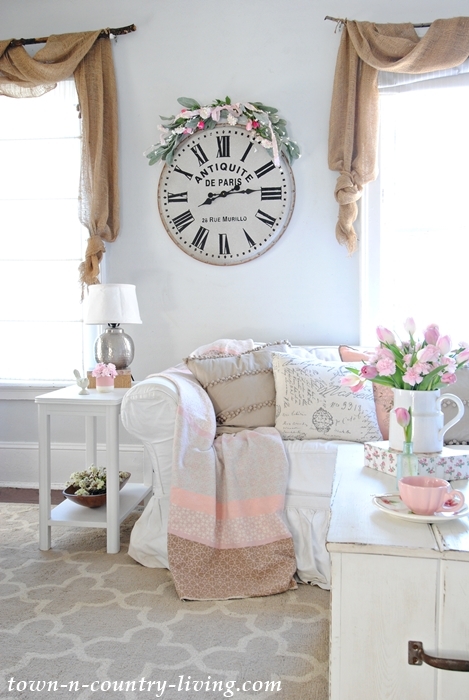 Decorating Tip #4: Use faux floral sprays to dress up a large clock or other piece of wall art. All you need to do is wire a few together and add a pretty ribbon. A small nail in the wall keeps it in place. 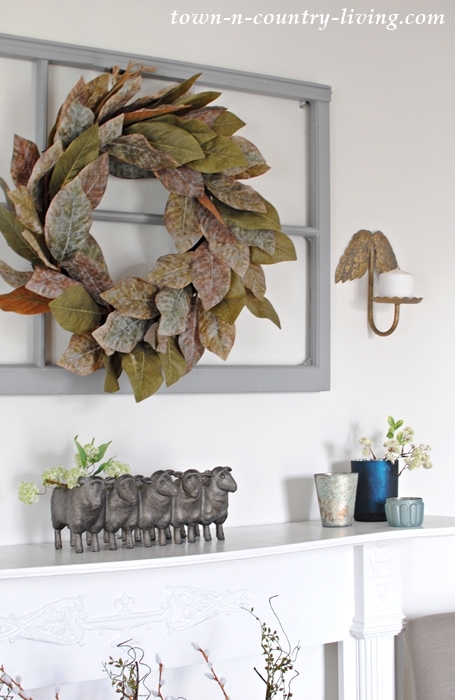 Decorating Tip #5: Use decorative items across the seasons. 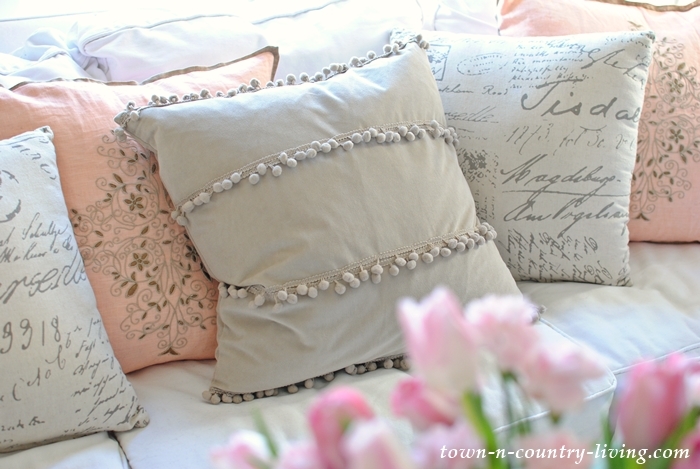 The pink pillows were a Christmas addition to my white sectional, and I’m using them again for spring. Stretch your budget by purchasing items you can use more than once per year. The fun pom pom pillows are a new find from HomeGoods. They’re bundled in packages of two for just $25. Score! 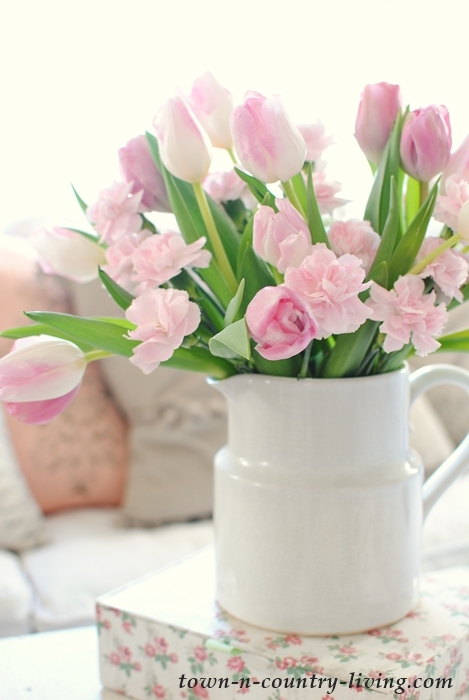 You can’t have spring without tulips and I chose pink for my spring home tour. 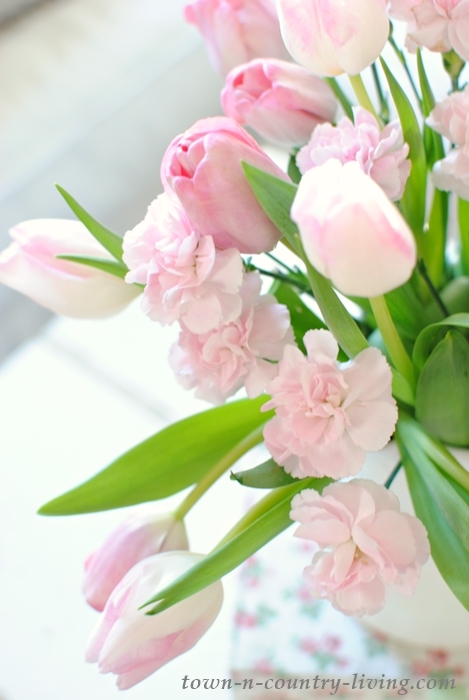 Tulips can get a little droopy so I added sweet pink carnations to help hold them up in my white ironstone pitcher. Soft colors for spring; it soothes my soul and gets me excited for longer days and warmer weather. 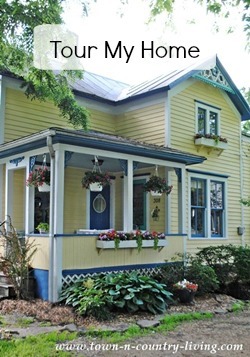 Thank you for stopping by to enjoy my spring home tour. 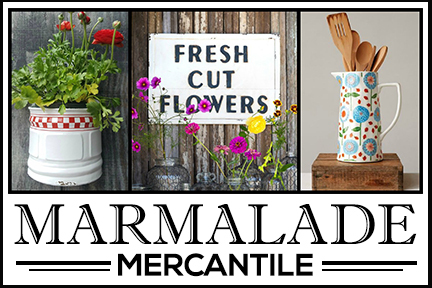 If you missed it, last week I shared my spring porch and entryway. What accents do you like to use for the spring season? 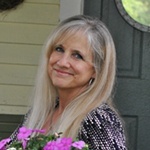 Be sure to visit all the gorgeous decor by my fellow bloggers! It all looks so clean, fresh and springtime! Just lovely, with all the flowers and white ironstone, and I’m especially lovin’ that cute sheep planter and pom pom pillows! Everything looks so fresh! The pillow collection is fabulous. Home Goods does have some really nice and unusual case goods. We bought a piece at Big Lots, of all places. We have had cold and snowy weather hit again so this was just what I needed to see. I love the ‘new’ living room Jennifer – from the carpet to the ceiling pendant light and the pretty chairs. The bird charts are so sweet and I love the sheep planter. I have always loved your sunny kitchen too. 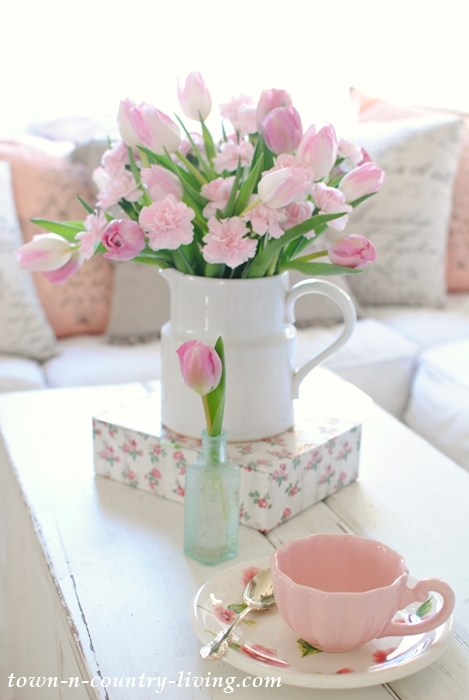 The pink and white decor of the family room is so pretty. It all looks beautiful and springy! Your home looks so fresh and lovely! 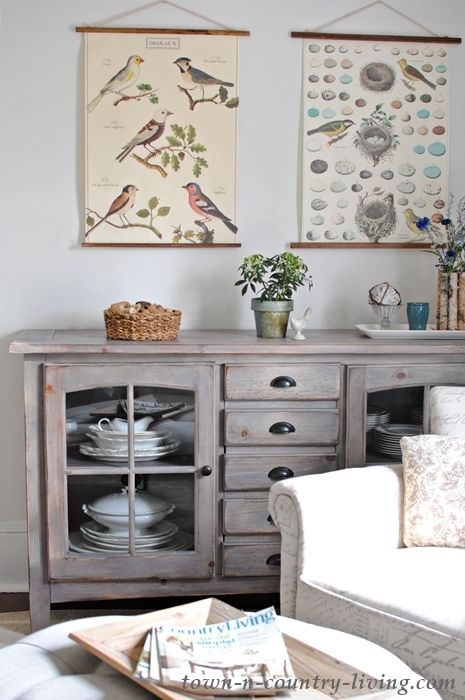 Love your ironstone in the kitchen and those pretty bird charts in your sitting room, so pretty. Thanks for sharing! 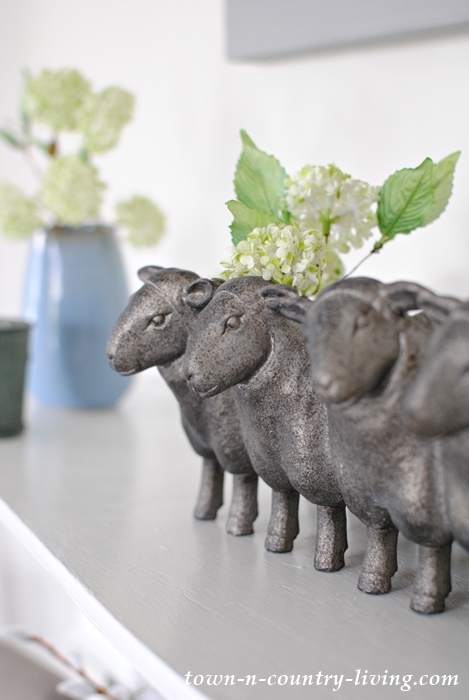 It all look so very Springy, i love your sheep planter,and so many other things, if i could just remember all i saw! Your new sitting room,oh well thanks for the wonderful tour. Jennifer, I love the new room. That ottoman looks perfect and I love the sideboard you found at homegoods. The bird wall hangings are gorgeous with it. 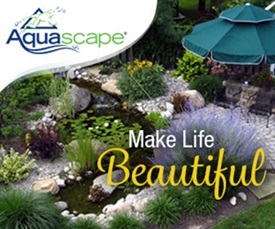 Such a treat to see your home ready for spring! Wow! What a change of pace for your sitting room. It looks soooo nice. And, i noticed that chest is holding dishes. But really, the room is so inviting. It looks bigger too. Jennifer – with your decor in the new sitting room and your new rug and pink accents in the family room, your home has taken giant steps forward in design this Spring. 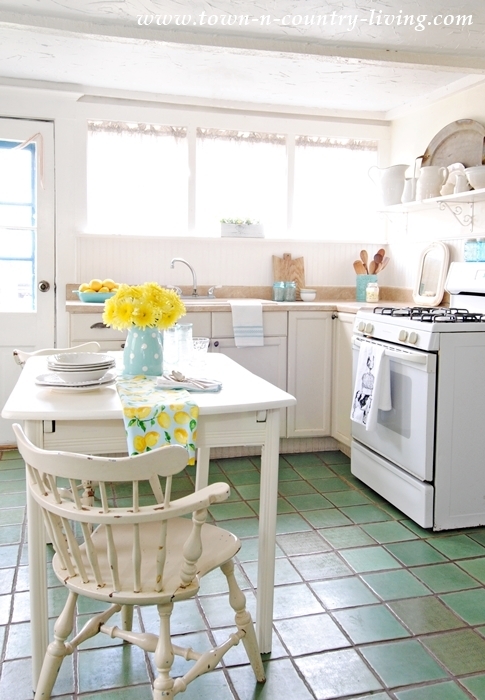 You know I always love the kitchen (and those green terra cotta tiles), but you have shown us that even a few small changes like new pillows, rugs and a coat of paint on a window frame can make such a difference. You’re way ahead of a lot of us this season and you’ve done great things. I can’t wait to see what you do with the new dining room location. I smile at that kitchen floor that moves in concert with every seasonal change of decor. ???? Such a fan of the flowers in the pitchers…don’t know which one I love more. 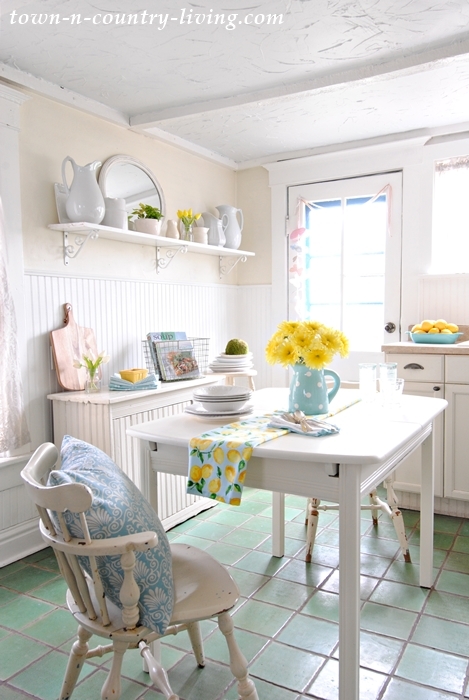 What a happy and cozy kitchen, the family rooms so inviting and comfortable…love every little thing. Your spring tour is so, so pretty, Jennifer! I love all your details and love those pom pom pillows. I am just now finding your lovely blog, and would love to know the source of the Bon Appetit sheep art. over your sideboard. BTW, I think “sideboard” is a Southern word, and the same piece is called “buffet” in the North. Is that your experience?